For his final production as artistic director of Rock Surfers Theatre Company, Leland Kean is directing a new Australian play by Aidan Fennessy called The Way Things Work, which won the inaugural Rock Surfers/Cordell Jigsaw Zapruder (CJZ) Playwriting Commission. A dark satire about corruption in NSW, from the highest level down to the criminal underbelly, Fennessy won’t have needed to look far for inspiration with the newspapers full of corruption allegations on both sides of NSW politics and elsewhere in the private sector. Investigative journalist Kate McClymont was a guest on opening night and in a short speech afterwards confirmed that the fiction on stage wasn’t that far removed from reality. The Way Things Work unfolds in three sections with two actors playing three sets of characters. The play opens with Minister Barlow (Nicholas Papademetriou) feeling the heat. The Minister (who surname has lent itself to umpteen scathing headlines) has overseen the construction of a multi-million dollar East-West road tunnel, funded by a public-private partnership. He has brought it in on time and on budget. The trouble is, it’s already beginning to crumble because it was built using ordinary concrete not the required “special concrete” and will eventually cost taxpayers vastly more to repair than it did to build. The project is now the subject of a Royal Commission and the Minister is keen that certain behind-the-scenes deals are not revealed. He calls his departmental secretary (Ashley Lyons), a senior public servant, in for a meeting and puts pressure on him to “forget” a certain name. In the second section, we meet the two Greek-Australian brothers whose company supplied the concrete and who are engaged in a power struggle of their own as their company is about to be bought out by a major media conglomerate. 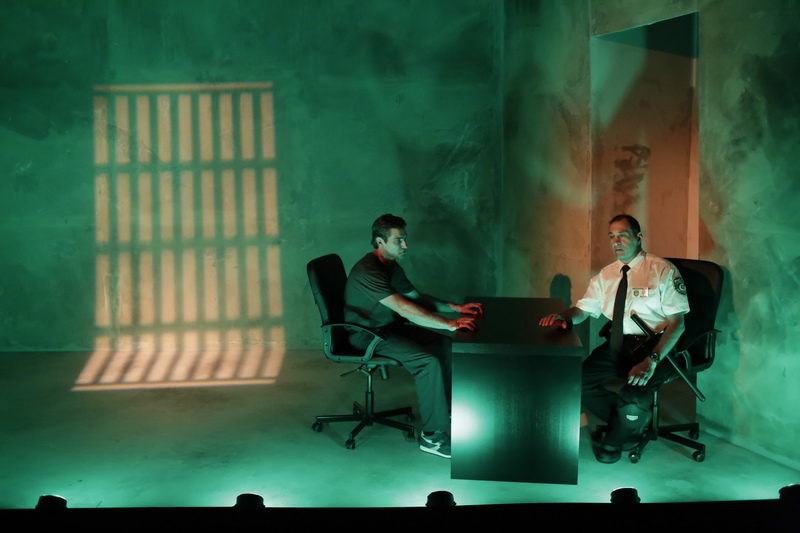 The third section features a prison warden (Papademetriou) and a prisoner (Lyons) who have forged a close relationship over many years. The warden has just enlisted the prisoner as a hit man to prevent another of the inmates testifying at the commission, but there is more bubbling away beneath the surface. Kean, who designed the set as well as directing, stages the play in a concrete box, which changes under Luiz Pampolha’s noir-ish lighting but which lends the piece a consistently tangible feeling of brutality, ruthlessness and claustrophobia, heightened by Jed Silver’s sound. On opening night Papademetriou rather overplayed the Minister so that the character verged on the cartoonish, undercutting any genuine sense of reality. Some of the dialogue he was given also stretched credibility a little. But Papademetriou settled down in the next two scenes with two far more potent, believable characterisations and as the play progressed the tension built nicely. Lyons gives a chameleon-like performance, morphing convincingly from the anxious public servant determined not to compromise his integrity, to the cocky, blinged-up brother, to the prisoner whose sense of betrayal is surprisingly touching. Running a tight 100-minutes, Kean keeps the action taut, driven by a macho energy. After a somewhat shaky start, The Way Things Work becomes a darkly funny, entertaining play that will certainly resonate with Sydneysiders. This entry was posted in Theatre and tagged Aidan Fennessy, Ashley Lyons, Jed Silver, Kate McClymont, Leland Kean, Luiz Pampolha, Nicholas Papademetriou, Rock Surfers Theatre Company by jolitson. Bookmark the permalink.